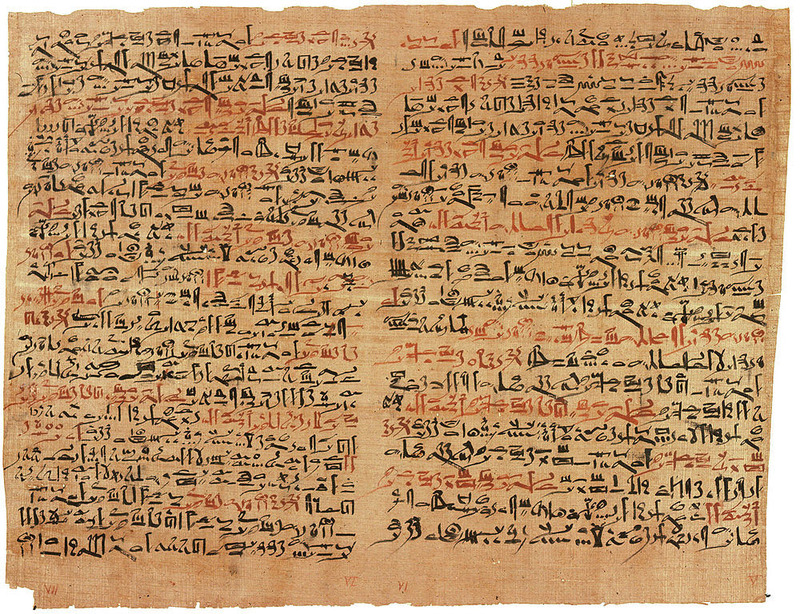 The Edwin Smith Papyrus is a medical document—the world’s oldest surviving text book on surgery. It was created in around 1600 BCE, but careful examination of the writing reveals that the document is only a copy of an even older medical treatise believed to have been written around 3000-2500 BCE. The scribe who copied the Edwin Smith Papyrus from the earlier document in the 17th century BC made many errors, some of which he corrected in the margins. Eventually, he pushed aside the document and left it incomplete, for reason which we may never know. Even uncompleted, the Edwin Smith Papyrus was an important document because it showed for the first time that ancient Egyptians had a far greater knowledge of the human anatomy and medicine than previously thought of. Notably, it showed that the Egyptians’ understanding of traumatic injuries—which the Edwin Smith Papyrus deals with extensively—was based on observable anatomy rather than relying on magic or potion. The Edwin Smith Papyrus may have been a manual for military surgery. It contains 48 cases dealing with wounds and trauma, such as injuries, fractures, wounds, dislocations and tumors. The cases are presented in a format that is not unlike what modern physicians use today. Each case begins with a medical history and physical examination of the patient, which include taking of the pulse, inspecting the wounds for inflammation, and the patient’s general appearance, such as the color of the eyes and face, the quality of nasal secretions and the stiffness of the limbs and abdomen, etc. Following the examination comes the diagnosis and prognosis, where the physician judges the patient’s chances of survival and recovery by categorizing the wound or affliction into one of the three categories: “an ailment which I will treat,” “an ailment with which I will contend,” and “an ailment not to be treated”. Finally, treatment options are described which may include closing wounds with sutures and bandages, fixing broken bones with splints, preventing and curing infection with honey, and stopping bleeding with raw meat, displaying knowledge of antiseptic technique and antibiotics. The Edwin Smith Papyrus also contains the first known descriptions of the cranial sutures, the meninges, the external surface of the brain, the cerebrospinal fluid, and the intracranial pulsations. The word “brain” appears for the first time in any language. The Egyptians were well aware that damage to certain parts of the brain could affect the function of the body causing conditions such as paralysis. The relationship between the location of a cranial injury and the side of the body affected is also recorded in the document, while crushing injuries of vertebrae were noted to impair motor and sensory functions. The papyrus shows that the Egyptians had an immaculate knowledge of the human anatomy. It describes the heart, its vessels, liver, spleen, kidneys, hypothalamus, uterus and bladder, although the physiological function of each organ was not fully understood. They knew that blood circulated through the body through the vessels, four millennium before William Harvey discovered circulation, but they did not know why. It took another thousand years before our understanding of the human body was furthered through the works of such ancient Greek physicians as Herophilus, Erasistratus and Hippocrates. Yet, some of the procedures described in the papyrus demonstrates a level of knowledge of medicines that surpassed even that of Hippocrates. Alas, the full extent of the medical knowledge of the ancient Egyptians will never be known. Those interested in the Edwin Smith Papyrus can read a translation of the cases described here.